We have now spent a week in Cienfuegos and have to admit that this city, the third largest in Cuba, has really got under our skin and we feel pretty at home here. It’s a little tourist hardened but when we go about our everyday stocking up and admin, which does take significantly longer than most other countries, we have come across some wonderful people who can’t do enough to try and help us and make sure we have a great time. 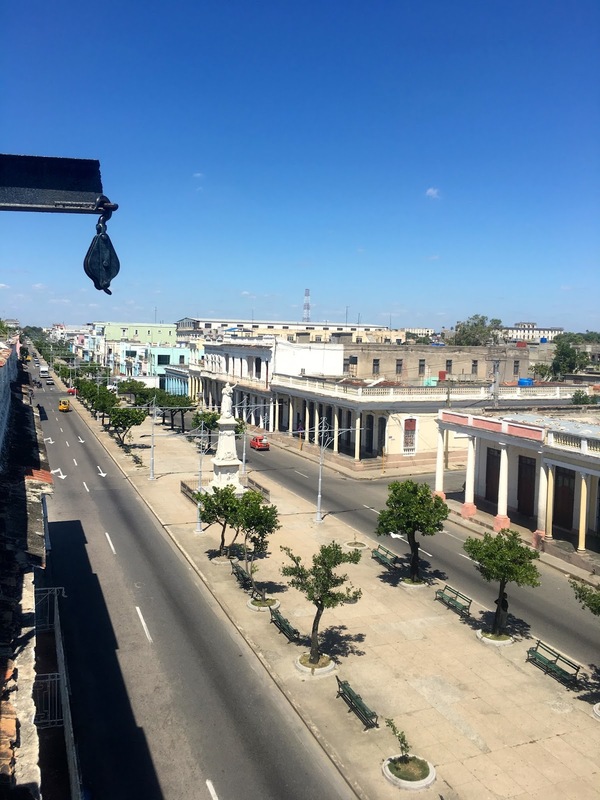 Cienfuegos was founded by the French and its glory day would have been quite something. The streets are wide and laid out in a perfect grid system. The architecture is palatial with impressive columns everywhere. It sits on the middle of the south coast, about two and a half hours by car from Havana. There’s a feeling of wealth in the town, which comes from tourism but also being an industrial and farming centre, plus UNESCO has invested in the city reforming the central historical area around the Parque Josi Marti. We are anchored off the marina in the Punta Gorda area, just opposite the stunning Palacio Azul and the Cienfuegos Club building – which is actually more like a cafeteria inside during the day, as it’s government run. However, at night it hosts fabulous concerts and events plus there’s a fairly nice restaurant with a mahogany bar upstairs. 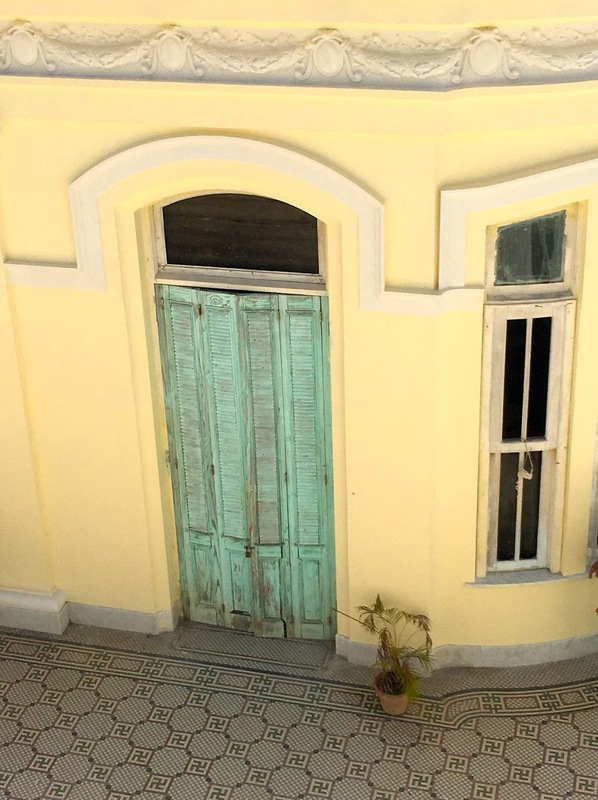 This area of Cienfuegos is where the rich sugar merchants lived and built lavish mansions. 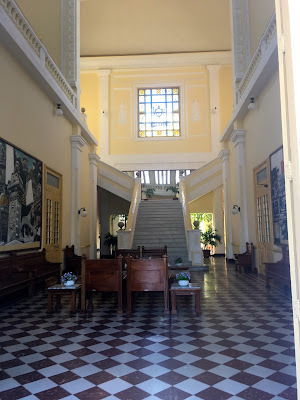 Just along the road there’s a kind of soviet looking hotel, built by President Batista’s brother and is actually really fancy inside but most importantly has wifi. Next to this is one of the most beautiful buildings I have seen in Cuba –described as ‘baroque meets Moorish’, the Palacio de Valle perched on the bay side attracting bus loads of tourists everyday. 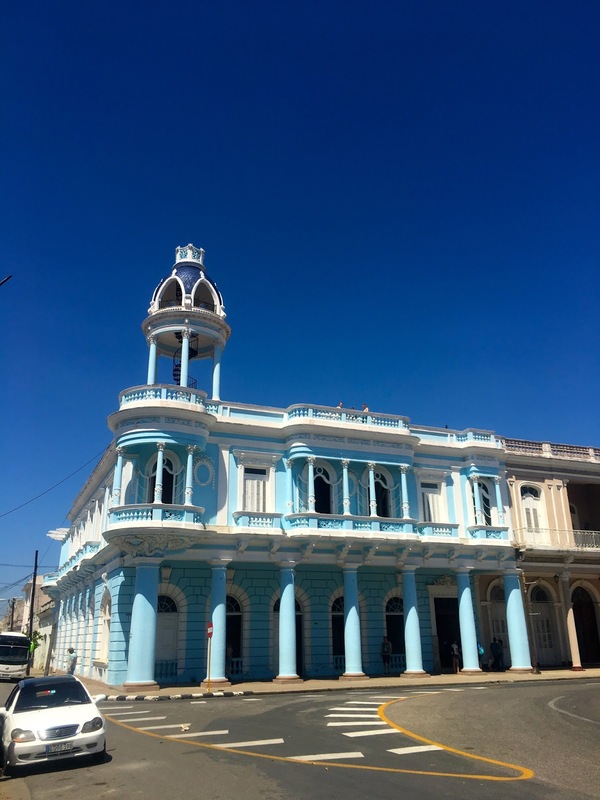 We get to walk along the Malecon every day by other beautifully restored buildings into the city, just 30 minutes away. Our first day exploring the city was great, we found a fantastic coffee shop just on the edge of the centre where we enjoyed a perfect ‘cortadito’ in the dark wood panelled casa behind a locked door with a hipster waiter wearing a bow tie. It is almost pitch black inside with no windows- ring the bell to get in and only six tables. 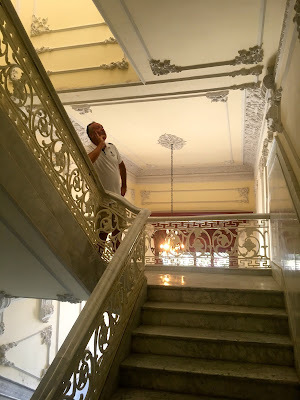 Then as tourists we went around all the main sites and had some fun in the Casa de la Cultura climbing the rooftop cupola and taking in the view. Lunch turned out to be a real treat, back on the Paseo del Prado (which becomes Calle 37 which becomes the Malecon- clear as mud?) we found the small doorway leading upstairs to the family run restaurant Dona Nora where we had the most fantastic meal of slow cooked lamb in a rich sauce. Randy, the owner’s son in law served us and he invited us to finish our drinks and have a chat on their roof terrace. 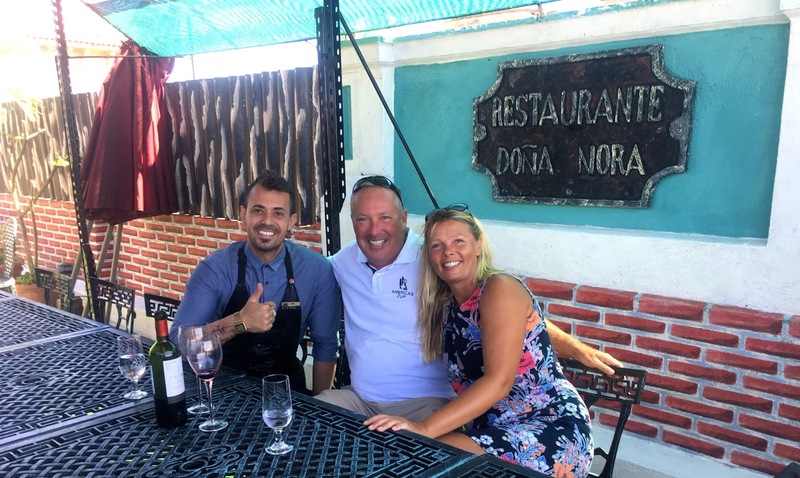 These guys are real Cuban entrepreneurs with really trying to learn how to make the best offering for visitors - we then returned to the restaurant for the most incredible lemon meringue pie. Fabulous! On Saturday night we decided to brave going ‘out out’. 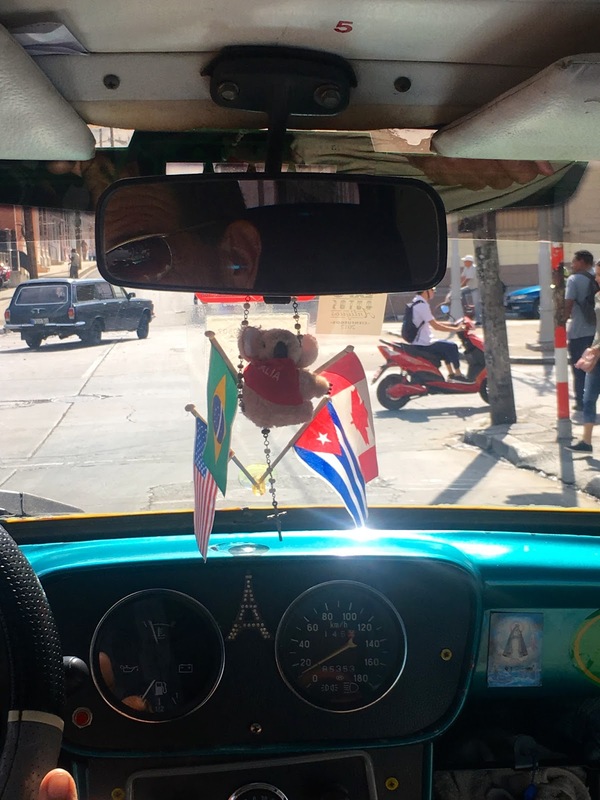 We got dressed up and took a classic Chevrolet taxi for 3CUC into the Plaza Jose Marti. We had a drink at the lovely historic El Palatino, which has the original floor and bar dating back to the 1800s in one of the city’s oldest buildings. Usually we would stay away from a bar right on the square however this is affordable and frequented by locals and tourists alike, a beer just CUC1.50. Our waiter told us to come back for music later, then we went off for dinner inspired by our first meal in Cienfuegos however we got let down a little at the next place with a cheesy music band. However, we did take in lovely classical performance just off the main street and went back to Palatino to watch a great band with 9 performers. After they finished we headed over to Teatro Café Terry where the music was fantastic; four music venues in one evening – welcome to Cuban nightlife. The marina staff are really helpful and have managed to arrange a refill of our cooking gas and get eggs plus given us detailed instructions to get our passport visa’s renewed; which we did today. Cooking gas is provided as part of the regular rations to Cubans hence its not for general sale. 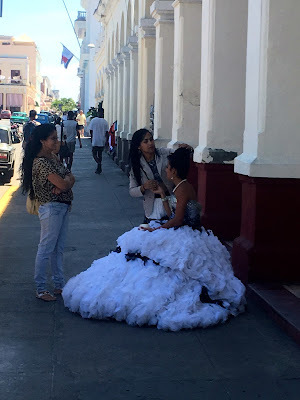 To get it involves finding someone to decant their ration into your gas bottle for cash – in Cuba most things are different to home but also most things are possible if you know how. Our entry visas are soon to expire as they last for thirty days. 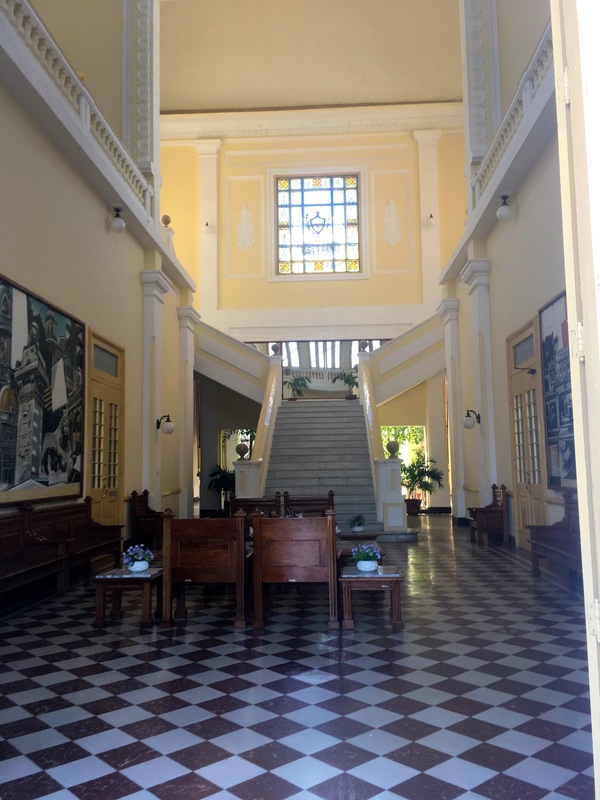 The process requires going to a particular bank to buy stamps at 25 CUC each – not that quick but easy enough, although we did have to wait a while as the cash was being brought in loaded in massive plastic bags through the front door, heavily guarded. After we got the stamps we took a taxi to the back of town to a large processing office where we had to get into line Cuban style – you walk into the waiting room and shout ‘Ultimo?’ – a man nods, that means I go after him and now I am the ultimo – the last person, and I take on that job until the next person arrives – brilliant! As soon as the man ahead was clear of the desk we jumped right in, we had heard this process could take all day but we got lucky and only waited about 20 minutes. I was prepared with all the paperwork required and we managed to get another 30 days in Cuba. 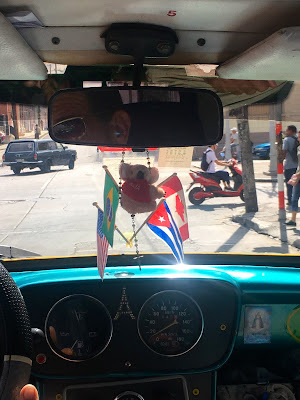 Yesterday we took a trip to Trindad de Cuba – pictures to follow, of course it was a brilliant memorable day made special by our taxi driver and new friend Ricardo…..
We just arrived yesterday in Cienfuegos, the “Paris” of Cuba, after a wonderful part of our Cuba experience, mostly under the water at Los Jardines de la Reina. It really is some of the most beautiful coral gardens I have ever seen. Apparently Christopher Columbus thought it was so beautiful that it deserved to be named after the Queen of Spain. 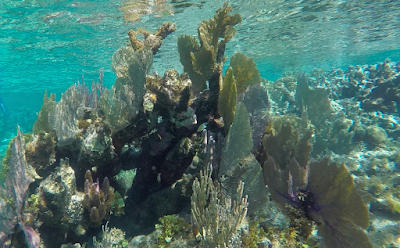 The water is so incredibly clear and the reef so pristine and healthy it was a joy to spend hours just drifting through the gardens. After leaving Cayo Cuervo we headed south and enjoyed a slow sail in about 10 knots of wind out into the ocean through a gap in the reef back into the rolling ocean swell. 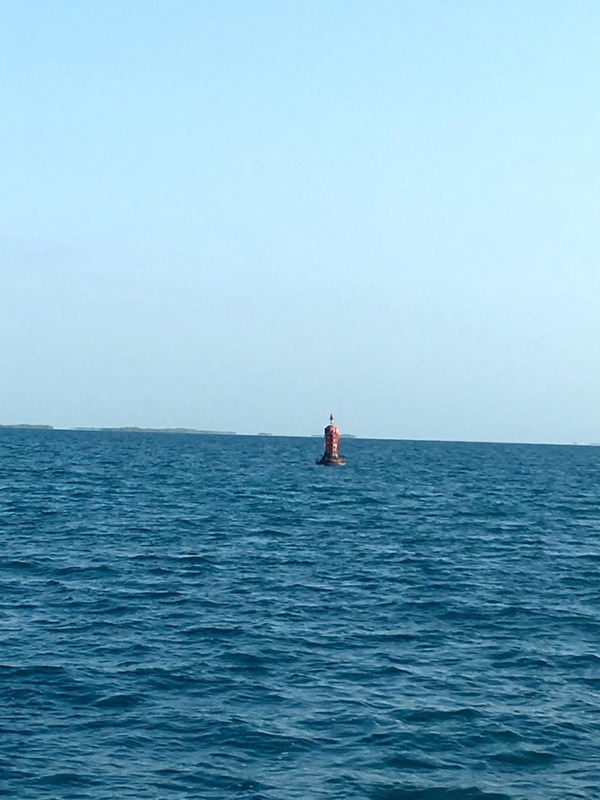 From this pass it was only about 5 miles to where there is a section of the reef that is submerged so we could sneak inside and get some protection from the south easterly swell and anchor near Cayo Alcatricito. There is nothing useful on our chart so we had to do it all by eye and it’s pretty scary as you pass over reef in such clear water it looks like it can’t possibly be deep enough. For once we used our headphones so we can easily communicate and we navigated through what looked like the deepest water and then made it to the sand and weed where the bottom flattened out and gently shallowed to the shore, so we edged our way in as close as we could with just half a metre under the keel. It was still a pretty long way out but the winds were expected to be light and the swell was our major issue. When we arrived we were totally on our own but by the time we launched the dinghy two French yachts arrived. 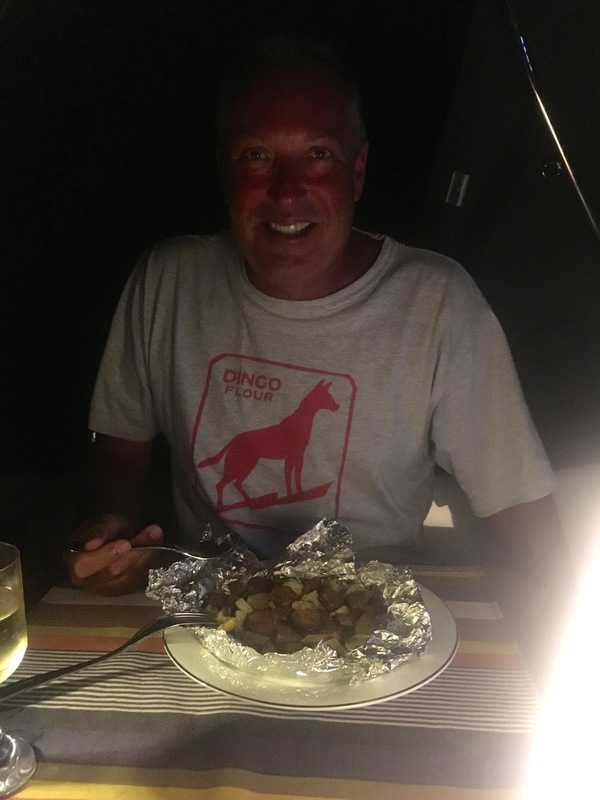 The next morning we took the dinghy to explore the mangroves and went right around the Cayo – we had read that there may be some crocodiles, but we didn’t find them just a lot of damaged mangroves – I suspect hurricane damaged. 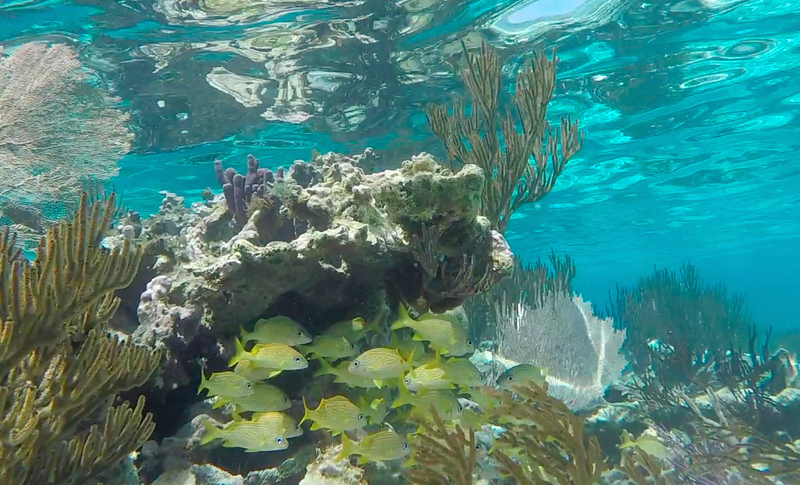 We walked for miles along the beach on Cayo Alcatraz then headed back to the reef for the calm afternoon at the reef. 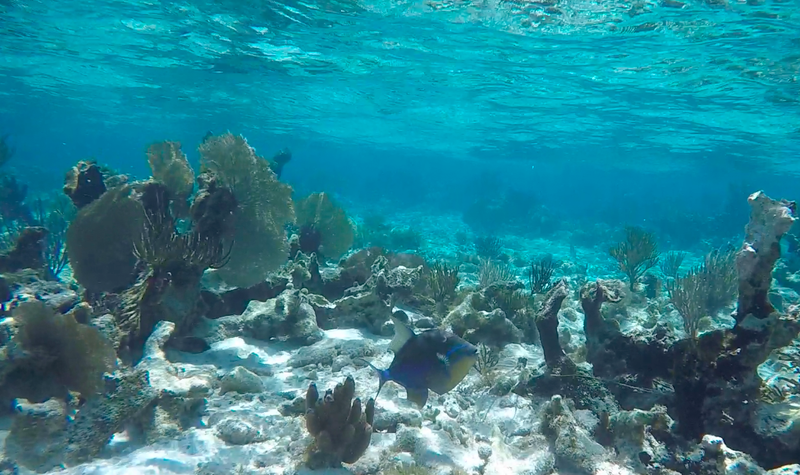 I don’t think I can remember such perfect snorkelling conditions. 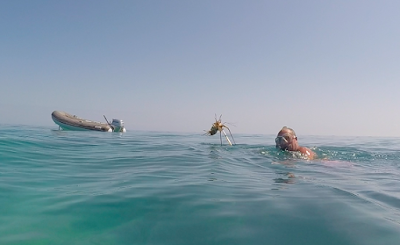 Then to end the day Andrew spotted a slipper lobster just strolling along – I quickly grabbed a pair of gloves and he made a great meal. That night a fishing boat came into the anchorage at sunset and quickly rowed over looking to trade lobster or fish for rum. 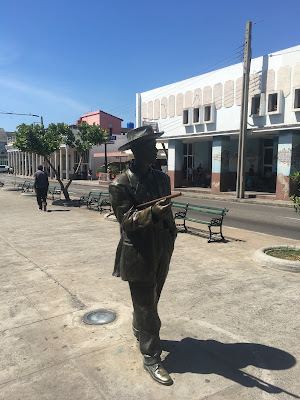 Fantastic – two lovely snappers in exchange for a bottle of rum that cost us 2CUC in Santiago. I through in a couple of limes and our last orange that actually came from Bob and Nan’s tree in Alabama – I think they’d approve! The fishermen were really happy too. The next morning we decided to go and check out the western end of Los Jardines and had a gentle motor sail down to Cayo Breton. 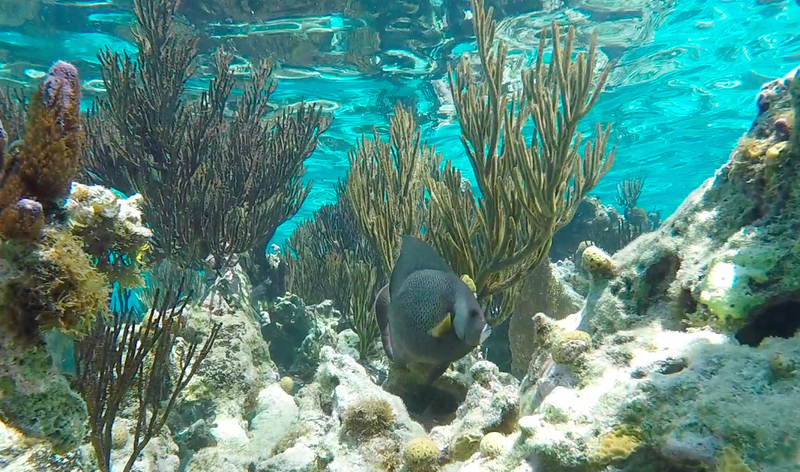 This was a little easier to get into with deeper water over the reef but a much more open bay. There is a a pass through the mangroves which we went to explore and found water deep enough to take Askari right inside if we felt the need but the bugs would most definitely be full on – lucky for us we had light conditions so were able to stay outside and took the dingy out about 2 miles across to explore the reef. We found the loveliest spot with huge boulders and such incredible fans with plenty of fish and a rather large shark that was sufficiently interested in us that it actually sent us back to the boat. 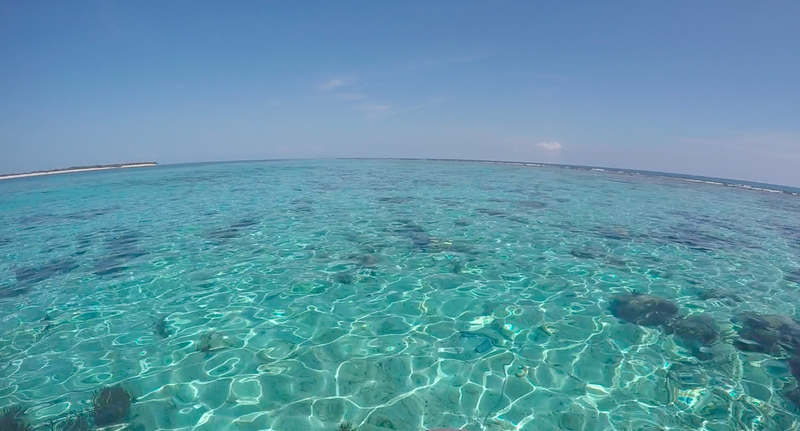 The reef was lovely but we had a problem – the beer had nearly run out! 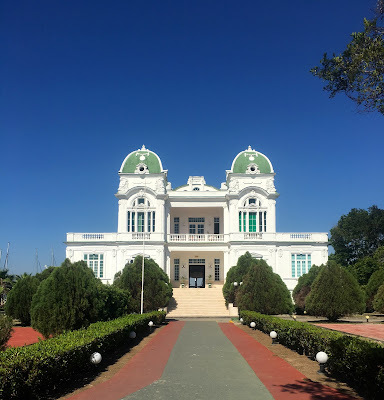 So we opted to make a longish trip to Cayo Blanco de Casilda for a quick overnight pit stop before heading on the further 40 miles to Cienfuegos and the bit city. Cayo Blanco is a tourist resort island (it looked pretty deserted though) and we arrived in pretty bad light. The pilot book and our chart differed significantly so we went slow and then anchored in 3m of water where the chart said we had 0.1m. All good until I went to swim on the anchor and we were right next to a wreck – so we had to start all over again in a new spot. After leaving Manzanillo we spent 5 relaxing nights in the Cays, away from the coast we can anchor wherever we please and there's no Guarda so no check in and out, but also no services or settlements so we will now need to be totally self sufficient until we reach Cienfuegos. 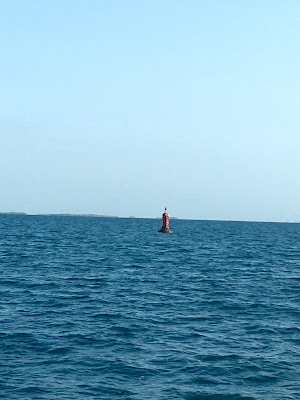 The south of Cuba is a maze of coral and mangrove islands and careful pilotage is required along with a good look out. Some of the main channels are marked and often there's a stick on a shallow patch or marking an entrance the fishermen use. Our first day out from Manzanillo was lovely and calm so we motor sailed West in about 7 knots of North East wind. We did a few boat jobs along the way while marvelling at the emerald green water - I really haven't seen water this colour. A cold front was due to clip the north of the island and we were expecting light Westerly winds that afternoon which came in just as we approach Cayo Rabihorcado -this gave us the unusual opportunity to anchor on the East side of this Cay. The beach on the east side of Rabihorcado is just stunning and the water so clear with a huge shallow sand bank covered in rays and turtles. We went ashore and swam in the crystal clear shallows - it felt like heaven. There wasn't much to see on the reef; weed and some coral and we went to explore the anchorage on the other side by dinghy; it was also nice but not as spectacular as where we were. We had a perfect calm relaxing night and then left the next morning at 9am heading further West. It was a bit cloudy early in the day and very light winds that completely dropped off by mid-day to officially zero and a glassy sea. Andrew caught a small snapper and I had a pedicure, then after lunch we caught a much larger crevalle jack. Woohoo the fridge was full of fish…..
We worked our way into the protected Cayo Granada, which is vitually totally encircled with mangrove and reef, with just a narrow channel of submerged reef that you pass over. It was eerie quiet with the calm lagoon and not a sound. 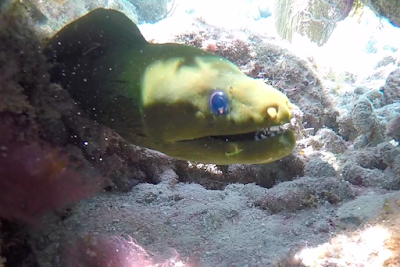 We went to explore the two wrecks in the centre of the bay and braved snorkeling in the murky water and found huge numbers of fish and two nice wrecks with some soft corals. On one side of the bay there's looked to be a sand peninsular - but when we got there it turned out to be stinky mangrove mud with horseflies. The land breeze from the north east came in early evening - zero wind to 16 knots and the smell of smoke arrived within 10 minutes. 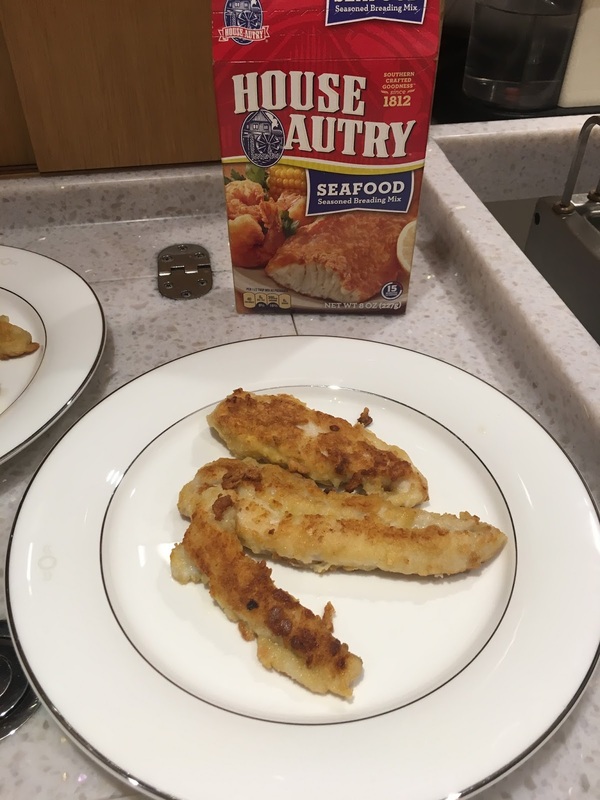 I cooked up the snapper with a breading mix Dianne gave us in Beaufort. 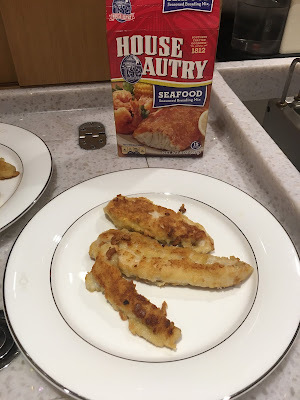 I would never have bought something like that but wow, you just wet the fish and zip it in the powder and it was like real battered fish. Andrew was so excited and the fish was delicious. 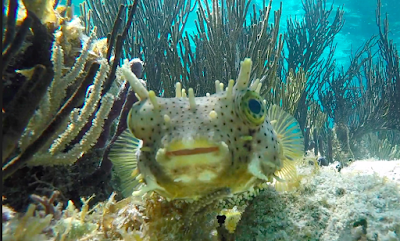 A long run was ahead of us the next day so we followed our track out of Cayo Granada and set a course through the Cays toward the very protected Cayo Cuervo. We went through two really narrow canals during the day, we snuck close to Cayo Malabrigo, which looked like the perfect sand atoll of the San Blas in Panama. We took a diversion from the charted route to save time and picked our way through the reef round two larger cays near to Cuervo - we had to do this to try and ensure we had good light to get over the submerged reef at the entrance - much like at Granada. It was all fine and then as we approached the Cay we saw a strange sight on our AIS - a yacht, wow people for the first time in 10 days! Then the name came up Rhapsody…. Omg it couldn't be our friends John and Ada we last saw in the Canaries and first met in A Coruna, we grabbed their card and confirmed it was their MMSI. They did the same and immediately called us on the VHF - what a totally amazing coincidence. So much so that with all the excitement we missed a huge shoal in the centre of the bay - woops, luckily it was just mud and sand. We had a lovely catch up with John and Ada over sunset, sharing all our adventures since we were last together. They left early the next morning and we decided to stay for a few days to wait for the perfect weather to go and visit La Jardines de la Reina. Cuervo actually turned out to be a busy and fascinating anchorage as it's a fishing base. The shrimp trawlers mostly go out over night and return in the morning unload the catch to a mother ship, get food or provisions from a supply ship and all work together. The mother ship then takes the catch back to port while they are out fishing. There are boats moving around nearly all the time and a lot of singing and loud talking. They are all numbered and mostly identical boats - C5 was the boldest that would come pretty close to us - really wanting us to go over and trade shrimp. We got used to the boats and even though at first I felt a bit nervous with so many of them (up to 13 one evening) but there were all friendly and a safe distance away from us. We got on top of our maintenance and laundry in this safe spot and spent a calm morning out on the reef on the southern side of the bay. 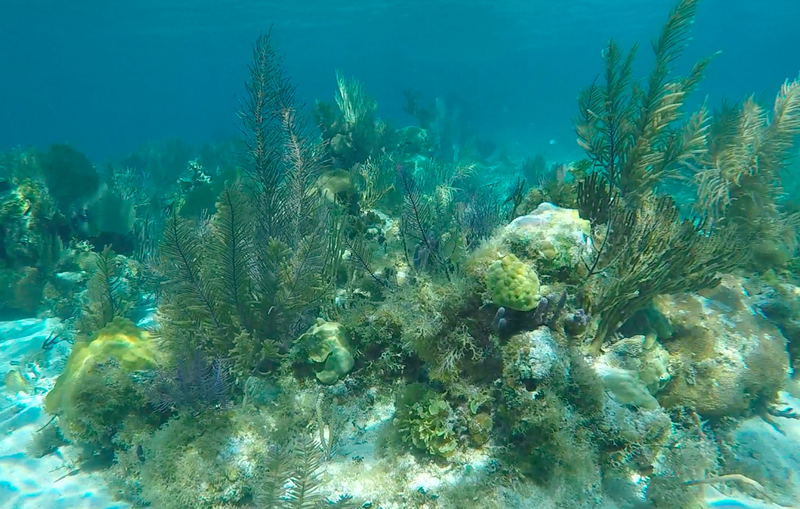 The water was fairly clear here and the coral quite nice but there was lobsters, lots of lobsters!! In the space of half an hour Andrew caught four - so exciting, we are definitely not going to run out of food out here. Saturday morning we pulled our muddy anchor that was so well set after a couple of windy days and headed south!